September 25, 2018 (CHARLOTTE, NC) Richmond Dental and Medical, a division of Barnhardt Manufacturing Company has made a three-year commitment of financial and in-kind support to the School of Dentistry at the University of North Carolina at Chapel Hill. Richmond’s two-fold commitment will run from 2018 to 2021. The gift of $75,000, granted by the Barnhardt Foundation, will give targeted support to student-run clinics providing comprehensive oral care to those in need across North Carolina. In-kind gifts, in the form of donations of Richmond Dental and Medical supplies, will support student-run international service trips to Asia, Central and South America, and Africa. A fourth-generation family-owned business in Charlotte, North Carolina, Barnhardt Manufacturing and its subsidiary Richmond Dental and Medical, have a long history of supporting the dental community through product donations to free dental clinics worldwide and various levels of financial support to industry associations that promote dental care across America. "Richmond has a long history of partnership with UNC Dental School dating back almost 70 years beginning with Ms. Nell Barnhardt, second generation of the family and president of Richmond Dental," said Tom Barnhardt, Chief Executive Officer and Chairman of Barnhardt Manufacturing. "During Nell’s tenure, Richmond supplied the dental school with graduation packs of products and financial support to assist with the students pursuing their education. This year, we aim to renew that partnership." Since Barnhardt Manufacturing’s inception in 1900, the company has been dedicated to strengthening the communities where we live and work. A minimum of five percent of annual profits are contributed to our NCFI/Barnhardt Foundation. Through this foundation, Barnhardt supports many charitable organizations through our local United Way agency, United Way Central Carolinas. Many other charitable organizations receive direct support in each of the eight communities in which we operate. Barnhardt’s giving has traditionally supported community organizations that are focused on education, childhood development, families in distress, homeless and faith-based initiatives, and medical assistance. The School of Dentistry at the University of North Carolina at Chapel Hill, recently ranked second worldwide among dental schools by the 2018 Academic Ranking of World Universities, has taken a leadership position in educating dentists and care professionals for over 68 years. “As a leading university and located in our home state, the UNC Dental School is ideal for Richmond to partner with in support of the dental communities served by the UNC students, professors and alumni,” said Tom Barnhardt. The three-year gift of $75,000 will primarily support a 50-year-old Carolina Dentistry institution, the Student Health Action Coalition clinic, known on campus and in the Orange County community simply as "SHAC." The SHAC clinic, launched in 1968 a service of the Orange County Health Department and later taken over by the university) opens for business 25 evenings each year, providing comprehensive oral care to traditionally underserved populations from Chapel Hill, Orange County, and surrounding communities. Student coordinators, with support from School of Dentistry faculty (including Triangle-area alumni as adjunct professors), run intake, triage, x-ray or digital imaging, examinations, and perform cleanings and extractions. Faculty perform emergency and more complex procedures when necessary. In addition to the SHAC clinic, UNC students and faculty also run free clinics at multiple Triangle locations in Chatham, Durham, and Wake Counties. 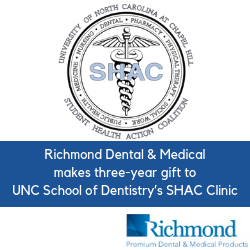 "Through the Barnhardt Foundation, Richmond Dental is thrilled to support the SHAC clinic financial gifts and in-kind product support," said Lewis Barnhardt, President and Chief Operating Officer at Richmond Dental and Medical. "The SHAC clinic is a great way for us as a company to help those who positively affect the dental care of underserved communities in North Carolina." "Additionally, Richmond Dental and Medical proudly supports with various gift-in-kind products to other noteworthy student-led outreach programs at UNC Dental School, such as the international trips and the CAARE clinic as a way to supply much needed products for the services provided and to support the students in their education," said George Hargrove, Vice President of Sales and Marketing at Barnhardt Manufacturing. "We realize that when we give to Carolina Dentistry, that we not only support the educational opportunities of students and faculty, but also their joint mission to provide oral care locally and globally to those who may never receive it otherwise. These are gifts that will have ripple effects, thanks to the willingness of the recipients to pay them forward." Founded in 1895, Richmond Dental and Medical is an award-winning, critically-acclaimed manufacturer of products and supplies for dental and medical clinics, including bite blocks, cotton balls, cotton pellets, braided cotton rolls, sponges, face masks, dispensers, and solution trays.